(People’s Daily, Beijing, June 01, 2010) A team of Russian experts arrived [in Seoul] on Monday, 31 May, to review investigation results of the sinking of South Korean warship “Cheonan.” The team met South Korean Defense Minister Kim Tae-young and was later briefed on the outcome of an investigation of the incident made by a joint team comprising civilian and military experts from South Korea , the United States and several other western countries, South Korea ‘s YTN TV reported. On Tuesday, the Russian team, consisting of submarine and torpedo specialists, will start receiving detailed briefings on the results of the investigation, said the report. The team will also visit South Korea ‘s 2nd Navy Fleet Command in Pyeongtaek where the wreckage of “Cheonan” is preserved, and inspect the waters near the island of Baekryeong where the warship sank. 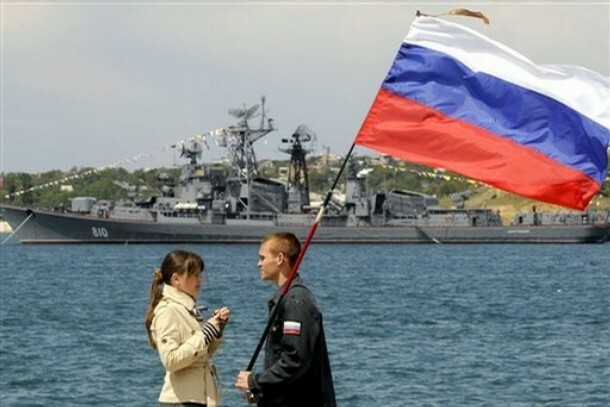 The Russian experts will complete the review within the week, according to South Korea ‘s Yonhap News Agency. The 1,200-ton “Cheonan”, with 104 crew members onboard, went down on March 26 off the South Korean island of Baekryeong due to an unexplained explosion. Fourth-six sailors were killed. South Korea on May 20 released investigation results over the incident, which said that the warship was torpedoed by the Democratic People’s Republic of Korea (DPRK). The DPRK immediately rejected Seoul ‘s claims, and said it will dispatch inspectors to South Korea to check investigation results. But the proposal was turned down. The Russian team was dispatched after Russian President Dmitry Medvedev called for all parties to show restraint over the incident. Reacting to the US Nuclear Posture Review publication, in mid-April 2010 Pyongyang officially confirmed its own position on nuclear weapons: ‘As long as the US nuclear threat persists, the DPRK will increase and update various type nuclear weapons as its deterrent in such a manner as it deems necessary in the days ahead.’ Along with others, Russia has to seriously question the viability of the two decades-old efforts for denuclearisation of the neighbouring country, with special accent on the relevance to the existing diplomatic framework. What is the purpose of the Six-Party Talks and what are Russia’s goals in this exercise? At present, the basic underlying approach for Russia is the denuclearisation of the Korean Peninsula. The Six-Party Talks are the most efficient way to accomplish that goal, and is the crux of Russia’s agenda. A ‘diplomatic solution’ – giving North Korea incentives, first of all security guarantees to make it abandon nuclear weaponisation – should be sought. Under no circumstances should military action or attempts to change the regime be permissible. Sanctions do not help either. Only a compromise can lead to a breakthrough. Under that logic, maintaining amicable relations between Moscow and Pyongyang is imperative both for Russia’s ability to prevent dangerous developments and to influence Pyongyang to be more receptive to compromise. Such an approach suits well the core Russian strategy based on its national interests and is in tune with the policies of its ‘strategic partner’ China. It is also useful to contain potentially hostile Western ambitions in a vital area where Russian positions have never been strong enough. This accounts for Russia’s seeming ‘passivity’. Deep in the heart of many Russian policy makers is the belief that a nuclear North Korea is less appalling than that of a destroyed North Korea. The status quo, which is actually not deleterious to Russia’s overall regional position, and can only be considered an indirect challenge to its global priorities, in my opinion, suits Russian interests. …As the member of the talks with the least ‘egoistic’ interests and responsibility to manage the issues of the mechanism of peace and security in North East Asia, Russia should put forward such an agenda. Any attempts to ignore Russian interests and role in the multiparty diplomatic process would be unacceptable. Leonid Petrov, a North Korean specialist and a lecturer in Korean studies at the University of Sydney, told Al Jazeera that relations between the North and South have been deteriorating for some time. “The inter-Korean relationship is destroyed now, co-operation has crumbled … the result was the sinking of the Cheonan, and I can see it’s a very logical result of this collapse in communication and inter-Korea relations. “Such accidents could have been easily prevented by diplomatic means – this is something President Lee jeopardised by scrapping the ‘sunshine policy’ [of rapprochement towards the North],” he said. The article by independent journalist Tanaka Sakai hypothesizes about what may have happened on the night of March 26 and after. Drawing on ROK TV and press reports and photographs, some of which were subsequently suppressed, Tanaka places at center stage a range of factors, some fully documented, others speculative, that have been missing, distorted, or silenced in US and ROK narratives: they include the fact and location of the US-ROK military exercise that was in progress at the time of the incident and the possibility that the Cheonan was sunk by friendly fire. Tanaka also presents evidence suggesting the secret presence of a US nuclear submarine stationed off Byaengnyong Island, the possible sinking of a US vessel during the incident, the role of US ships in the salvage and rescue operations that followed, the failure of the submarine USS Columbia to return from South Korea to its home port in Hawaii, and the death of an ROK diver in the attempt to recover that vessel. At stake are issues that could rock the ROK government on the eve of elections, and could impinge on the US-ROK military relationship as the US moves to transfer authority over command to ROK forces by 2012, and to expand the role of China in the geopolitics of the region. There are implications for tensions between North Korea and the US/ROK on the one hand, and for the permanent stationing of US nuclear, and nuclear-armed, submarines in South Korean waters. Above all, there is the possibility that renewed war may be imminent in the Korean peninsula (Introduction by Mark Selden). The Chosun Ilbo (19 May 2010) Investigators have found at the 11th hour found a desperately needed smoking gun linking North Korea to the sinking of the Navy corvette Cheonan, a government official claimed Tuesday. Investigators apparently discovered a propeller from the torpedo that likely sank the ship in relatively good condition in waters where it sank and the serial number inscribed on it is North Korean. “U.S., Australian and other foreign experts who took part in the investigation agree that a North Korean torpedo caused the Cheonan to sink and that this is the smoking gun following various pieces of the torpedo and traces of gun powder that had been gathered so far,” the official said. Another government source said fishing trawlers deployed in gathering evidence found a fairly intact torpedo propeller buried in the mud at the bottom of the ocean over the weekend. “It’s a double propeller that obviously comes from a torpedo,” the source added. Investigators apparently compared the propeller to one attached to a North Korean training torpedo that the South Korean military obtained seven years ago and proved that the two were made of similar materials. Torpedoes are powered by two sets of propellers that rotate in opposite directions. Investigators are said to have conducted a computerized simulation and reached a tentative conclusion that a 250 kg, mid-sized sonar-tracking torpedo exploded 3 m below the gas turbine room of the vessel. 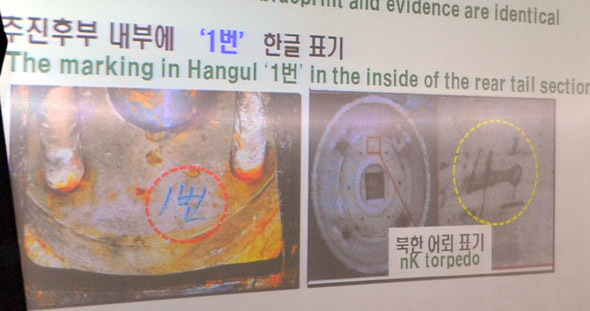 They have apparently proved that the traces of explosives found on the Cheonan are similar to some of the propellants used in the sample North Korean torpedo. 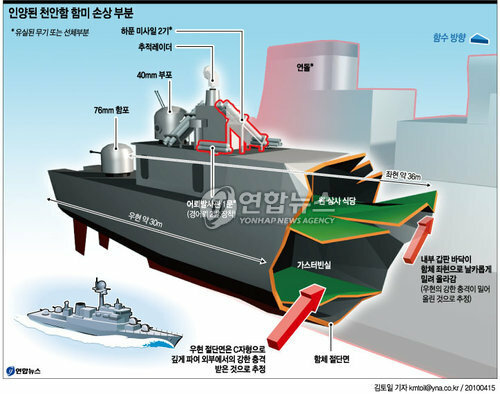 The military has transported to a Navy base in Pyeongtaek the diesel engine of the Cheonan, which had been separated from the vessel during the explosion, and is looking for traces of gunpowder. The gas turbine has also been found on the sea floor and authorities are planning to hoist it out of the water. – Why would North Korea attack South Korea? 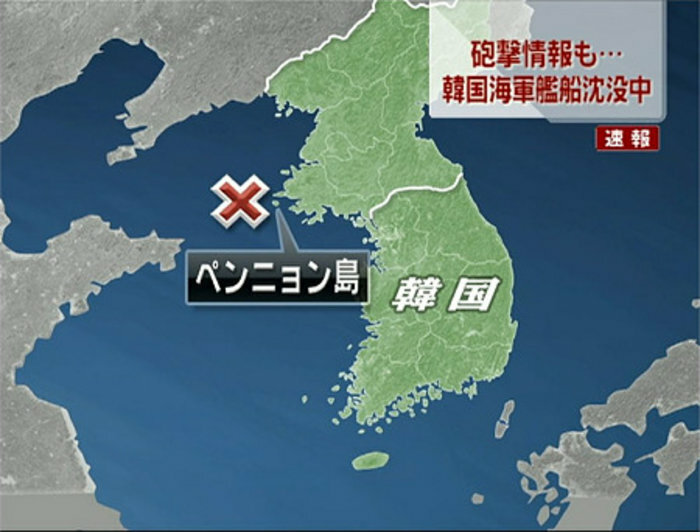 > We still do not know whether it was NK who attacked the SK boat Cheonan on 26 March. But if it was NK, then the only reason for such attack would be a retaliation for the November 2009 naval clash where SK navy sank a NK boat. – How trustworthy are the allegations and the report, the SK opposition have accused the government for warmongering and using this as part of the election? > The high level of secrecy under which the investigation has been conducted shows that Seoul does not want the public to know everything about the findings and conclusions. The current SK administration is known for its anti-NK stance and all findings and conclusions are likely to support the hard-liners’ political views. – What can SK do, what will be the consequences and the ”resolute” response, they have been talking about? > Since 2008, Seoul has lost any leverage on NK due to active disengagement from economic and political cooperation with Pyongyang . The only means SK is left with is military force. However, the export-oriented economy of SK will not sustain any sizable military operation on the Korean peninsula and, therefore, SK will not initiate anything heavy-handed. The “resolute” response will be limited by economic sanctions and psychological pressure against NK. – Why have NK kept silent about this, wouldn’t they have been bursting about it? > What happened on the night of 26 March is still a mystery. It is also possible that the real culprit of this tragedy is not NK but a third party. Some non-governmental organisation (NGO), which is unfriendly to both NK and SK, could be behind the attack. Therefore, the explosion is as surprising to NK and to SK. While Pyongyang might have the feeling of revenge but the matter is too sensitive to assume the responsibility openly. This year marks the 60th anniversary of the start of the Korean War which resulted in over 4 million civilian and military deaths and a legacy that still poses a threat to global security today. So why do so few people know anything about it? Why is it called the “Forgotten War”? Let us put you in the frame – we’ll show you how it was seen at the time through the eyes of communist and anti-communist filmmakers. The Forgotten War – Remembered in Film. Venue: Old Geology Lecture Theatre, Edgeworth David Building (adjacent Parramatta Rd and Footbridge Theatre), The University of Sydney. Based on Cho Chongrae’s bestselling novel of the same title, this epic film chronicles events that took place in the small town of Pŏlgyo in the Southern Chŏlla Province before and during the Korean War. A sweeping historical saga is combined with the intimate portraits of ordinary Koreans trapped in the horrors of internecine ideological warfare. Free entry. For more information contact Elizabeth Connor on +61(2)9351 3551. 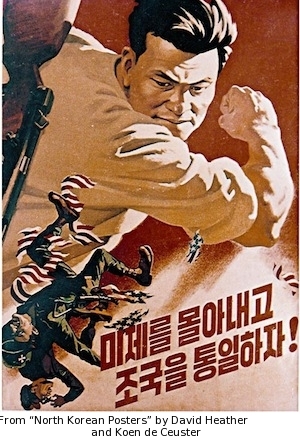 North Korean Film Screening – 19 May, Wednesday, at 5.30pm, The University of Sydney. 5:30pm – Film presentation and discussion. 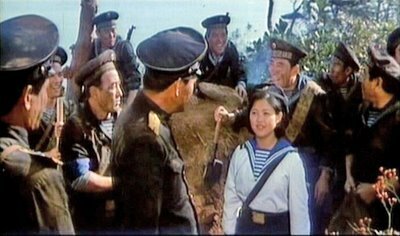 This North Korean film gives a vivid representation of the tragic fate of coastal battery unit that fought to the last man protecting the Wolmi Island in September 1950. Countering 50,000 troops and over 500 warships of General MacArthur, the North Korean battery commander Li Tae-un and his company men checked the UN landing operation for three days by displaying unprecedented bravery and a high degree of self-sacrificing spirit. This film also depicts the role of women conscripted to participate in the Korean War alongside with men on the frontline and in the rear. One of the classics of North Korean cinematography, this film emulates the best examples of Soviet and Chinese film-making traditions. The story is based on the famous novel by Paek In-jun about the twins separated by the Korean War. Never heard about each other again, the twin-sisters live in the very different societies separated by the civil and ideological conflict. Keum-hee lives a happy and comfortable life in North Korea, where she can see her talent for singing and dancing fulfilled. 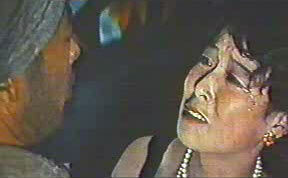 Her sister, Eun-hee, on the contrary, is destined to suffer in the South, surrounded by social evils and class inequality. 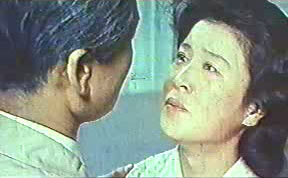 This film laments the national division and masterfully portrays the grim reality of the post-war time in Korea.